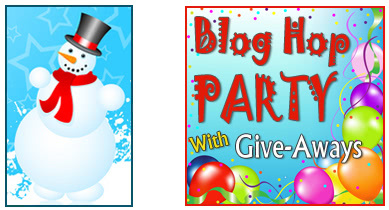 another Blog Hop Party with Give-Aways! What a great way to beat those Winter Blues! For many of you it is snow, snow and more snow. Here in Charlotte it is rain, rain and overcast days! I can't think of a better way of brightening up our days, can you? For those who are new to my blog here are two of my recent finishes. Currently I am working on a baseball t-shirt quilt. So Let's Party and Have Some Fun! Party begins Friday March 8 and ends March 15. The drawing will be March 16. Your gift will be in the mail by March 20. Random Generator will determine who the winner will be. 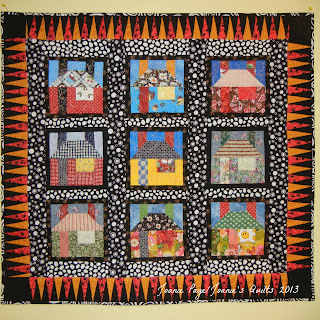 Don't forget to visit Quilting Gallery to see all the participants (203) in the Blog Hop Party. Now let's move on to more fun stuff! Grab a cupcake - in the spirit of St. Patrick's Day! I'm Irish descent so I need to celebrate! Do a jig! Well I may shake it a bit! Put on the Celtic Music! Recipe at Loves to Eat. Your choice of one of these pretty Jelly Rolls. 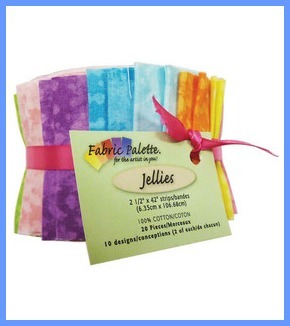 Both are Fabric Palette Jellies from JoAnn Fabrics. Each roll contains twenty 2- 1/2x42 inch strips of high-quality 100% cotton fabric. (1) Follow me and in your comment tell me how you are following me. 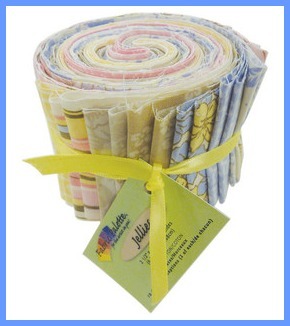 (2 ) Leave a comment telling which jelly roll you prefer. Follow me on Pinterest and return to comment. Wishing you Luck and Blessings! I'd pick spring prints! My daughter got a jelly roll from Joann's and we made a beautiful quilt together. Thanks for the chance! I am a follower. thanks for the giveaway. If I were to win I would like the spring prints. Wishing you luck and blessings too. I am a new follower and if I won would love the batik roll - those bright, cheerful colours will Beat the Winter Blues away for sure!!! I would love the batik-like roll - beautiful colors! Thanks for sharing the Irish blessings with us. Some are lovely and some are just plain funny. Many thanks for the giveaway! new follower. I'd like the batik prints. I think they match the fat quarter bundle that my sister gave me a while ago. I like the Spring Prints! Thanks for the chance to win! I am a new North Carolinian quilter, glad to find new places and quilters here, I like the spring fabrics. look forward to reading your blogs. Happy St. Patrick's Day soon! I love the spring fabrics. I like the Spring Batiks....but I like the Spring Prints too! Thanks for the chance to win! I would pick the Spring Batiks. I am in desperate need of some blenders. I enjoy following you in several places, but here of course! Thanks for your kind encouragement and inspiration. I'm a new follower with GFC. I love the Spring Batiks. Thanks for the chance! Both are pretty but Batiks are calling me, Thank You! I love the Spring Batiks. I prefer the Spring batiks. I'm a GFC follower. I like the batik look! I am a new follower with GFC. I follow on pinterest. You have great interesting pins. I love the Spring Batiks Joanie and follow you! I am now following you on Pinterest too! I like the Spring fabrics best, but either would be great. Thanks for the chance! I follow you via RSS Feeds. I follow via Google. I like the Spring Batiks. I never purchase Batiks for myself and this would be a great chance to use some! I also follow via Pinterest! I am following your blog now. Either one of these beautiful fabrics would be great to win. Thanks for the chance. I'm already a follower. :) Love your quilts! I really like the Spring Prints roll and already follow you on Pinterest too! Oh I love the batiks the most they are wonderful. I follow you on GFC, and I love the spring batiks!! Thanks! I now follow you on Pinterest too, I am Elisabetta B.
Hello, I love those Spring Prints. Thanks for the chance to win. I like the Batik-like fabrics. Am in love with Batiks and Batik like fabrics so that would be my choice. New follower via GFC. 1. I follow you by GF. Thanks for bein in the hop. 2. they are both beautiful, but I sort of like "Jellies" spring batik-like a little better. Thanks for the fun. I follow on GFC and love the Spring Prints. Thanks for participating in the hop. Following on GFC and love the first set of soft colors - perfect for the guild's donation baby quilts I make. Thanks for participating and I hope you'll check out my post too. Wow picking one....I like them both. Guess I would pick the Spring Batik. Thank you for the chance to win. I am now following your blog via the feed option. Thank you for the chance to enter your giveaway. Both of the fabric choices are lovely. But I think I like the spring batik-like ones the best of all. The spring batiks are my favorite! I use batiks for my 3-D fish. I follow you through GFC. I would be pleased to have the Spring Prints. I really can't pick one Jelly Roll. Either Jelly Roll is a winner by me. I would just happy to win either one. Thank you for giving me a chance to win and for participating in the Blog Hop. HI! I'D CHOOSE THE 'SPRING BATIK-LIKE'! THANK YOU FOR A BEAUTIFUL SPRING GIVEAWAY! I'm a new follower and I love the Spring Batiks. thanks! I would love love the Spring Prints they are so pretty. Thanks for such a super giveaway. I love the spring batik-like fabric roll. I love the spring prints! 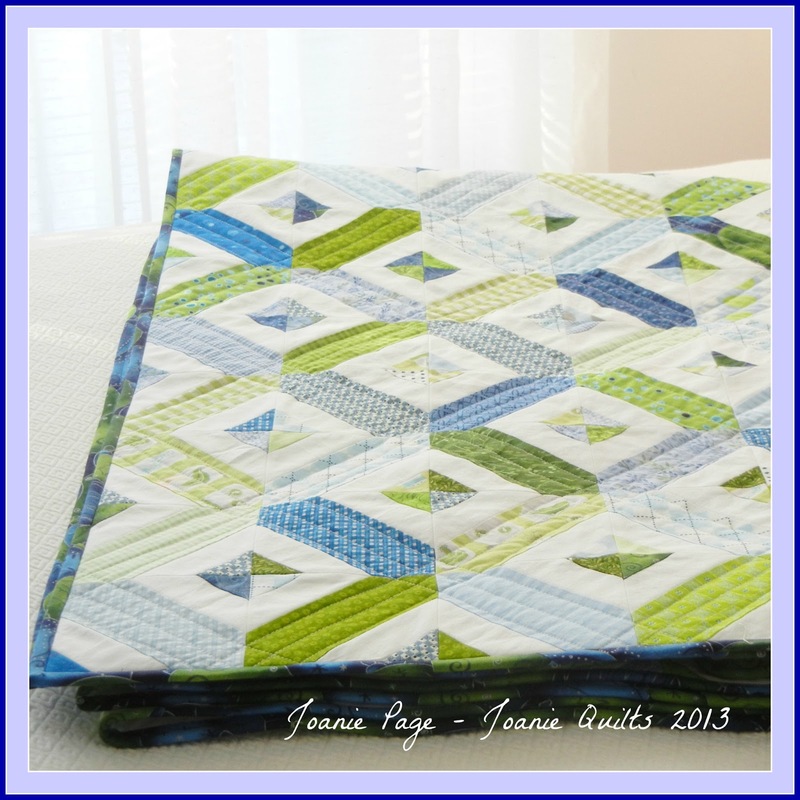 Hi Joanie you have some lovely quilts and a great blog. Thank you for leaving me a comment today. I like the spring roll but hey the batik one is lovely too. 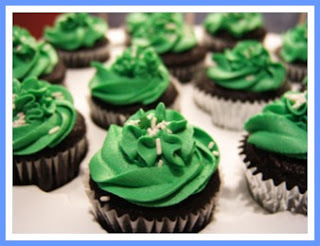 I too wish you your Irish blessing and the cupcakes are delicious....lol I am following you by google. Thanks for this generous giveaway, and for your inspiring blog. I love the quilt with the kitties on it! The batik-like bundle would be my first choice, but I love them both! I follow via Google. I like the spring prints. Thanks for chance to win. I follow through GFC. Thanks for participating in the blog hop. It is always fun to read new quilting blogs. HI Joanie! Happy to follow you on Pinterest (msstitcher)! I'm following through GFC and just love your blog. Thank you for the chance to win some Spring Batiks. I'm a new follower, and in January I left NC for the cold and snow in PA - I need some spring colors! The prints are so pretty, and so are the batik colors. 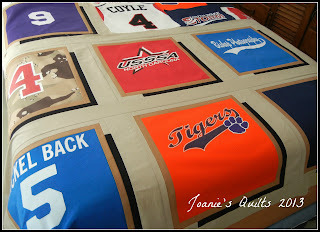 I just love your baseball t-shirt quilt. I'm making one for my daughter with all her soccer/tennis shirts, and its coming along nicely. thanks for the great giveaway. I'd choose the spring prints. I'm following through GFC. Thanks for participating in the Quilters' Blog Hop Party. via GFC. Thanks for the chance to win! I am a new follower on GFC! I love prints! I would pick the spring prints! Thanks! I like the Spring Batik colors. Great giveaway! Thanks! I am following you on Google + or at least I've added you to my quilting circle so you can add me back and we'll be connected. Great giveaway! Those fabrics are gorgeous! I like the brighter batiks! I could find a project for those in an instant! I am a new follower of your blog. I like the spring prints. Thank you for the chance to win. I follow on google. Thank you for giving me an opportunity to win these beautiful batiks! I am a new follower on gfc. I would pick the batik-like jelly roll. Ohhh I love the batiks, but both are very pretty!!!! I follow your blog on network blogs. Love the colors in the spring batik like. I follow you via GFC and would love the Spring Prints. I follow you on pinterest :) That place is addictive!!! Thank you for participating in the blog hop! I also selected to follow a number of your boards on Pinterest. I clicked to follow - great system as it reminds us to return to see new projects and ideas! I like both the rolls but my first choice would be Spring Batik-Like - would be fun to have these bright colors enhance a project! Thanks for putting my name in the hat for your drawing! I am now a new follower and I see you are following me. Such fun. Can't wait to see your new projects. I sure love the T-shirt quilt. So different. Love it. Thanks for having a great give away and see you in future blogs. 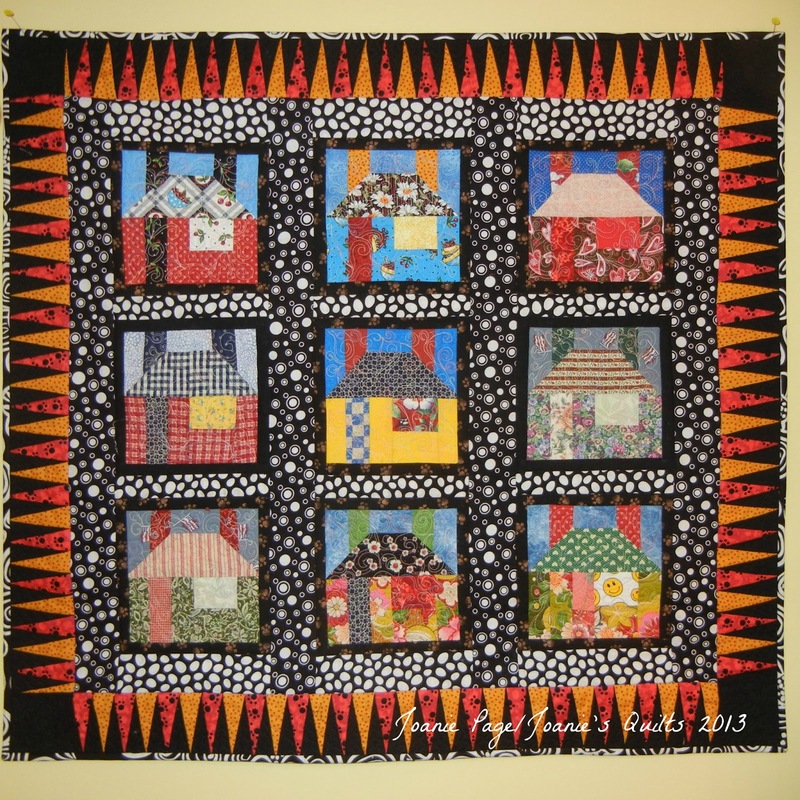 I'd love to win the Spring Batik fabric for my group, World of Charity Stitching. I love the spring prints jelly roll. Love both of those jelly rolls, and that blue and green quilt. I have pinned you. Thanks for the chance to win! My email is on my website. I am already your follower and I love the spring jelly roll. I am already following your pinterest pages...love them...and I meant to say the spring prints jelly roll. I'm now following you of GFC although if you had an email notification option, I would prefer to follow that way. I just love the Spring Batik Jellies. Love those colors. I am following your blog, on Pinterest also. I did enjoy your lettering information. Took it and kept it on my sewing info. The Spring Batik Like Jelly Roll is great! Both of them are. I found you through linked in. I love your blog and look forward to seeing more of it! Thanks for sharing. I like the bottom on Bright and bold! Ps. I love them both truly. I will look for you on Pinterest as well! Thanks! The Giveaway ended Friday, March 15th. Thanks for all who have come by since that time. The drawing was made and the winner has been announced.